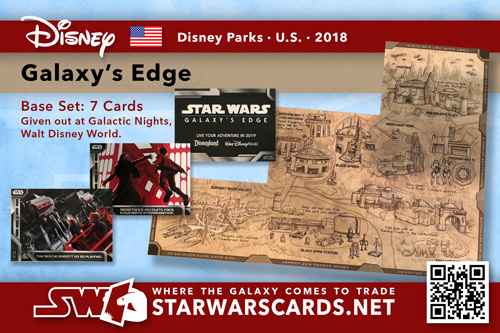 Given to those at attendance at Disney World's Galactic Nights, this 6 card set previews some of the upcoming attractions when park attendies arrive on the planet Batuu at Disney's Galaxy's Edge, part of Disney's Hollywood Studios. 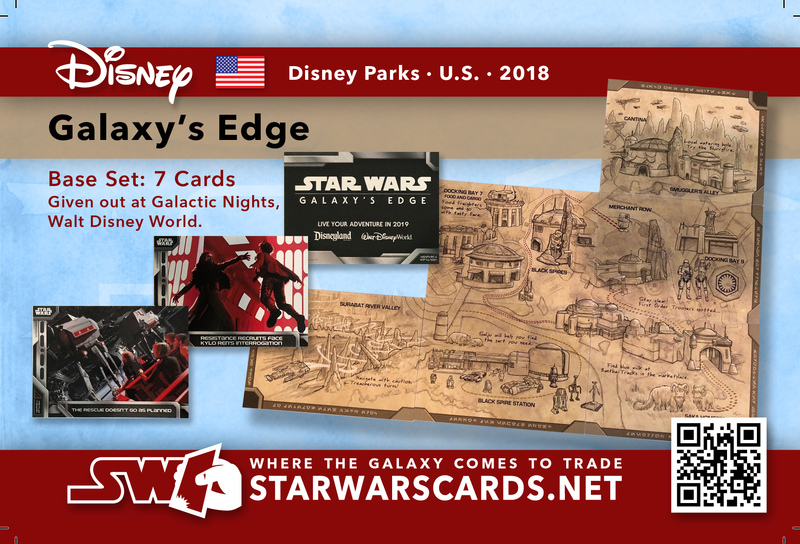 The front of the cards feature Concept art, while the back of the cards is a puzzle that showcases pieces of a map of Batuu, showing some of the places guests may visit. However it seems with 3 cards missing this set may not be complete...yet. Smuggler's Alley The local watering hole, also a place where guests will find smuggler’s, bounty hunters, and thugs. Live music and DJ Rex set the mood in this lounge establishment. Docking Bay 7 Food freighters come and go with tasty fare. Merchant Row Home to many shops. Docking Bay 9 is where the First Order has set up shop for their recruiting. Surabat River Valley Navigate with caution. Treacherous turns! Black Spire Station Salju will help you find the part you need. Saka Homestead Find blue milk and Bantha Tracks in the marketplace.